Raffles Museum News has shifted - update your bookmarks! 05 Jul 2007 - Raffles Museum News is shifting to a Wordpress engine. The URL, http://news.rafflesmuseum.net now points to a new site. The feed also remains the same: http://feeds.feedburner.com/RafflesMuseumNews. This is the third version of the Raffles Museum news site, the first was prepared as html webpages (2000 - 2004), the second, this blog used Samizdat, a geeky format based on PHPosxom and Blosxom made simple (2004 - 2007) and now we are using the free blog engine Wordpress. Wordpress enthusiast and Raffles Museum volunteer Kenneth Pinto (NUS CIT) dropped in to help with the transition; thanks Kenneth! I have also handed over the mangement and running of the site to Chua Keng Soon and Martyn Low. Have fun lads! Photo by Tan Swee Hee. Mon 25 Jun 2007 - This morning, Greasi was shocked to read the obituary announcement that the family of Mr Yeo had put in The Straits Times. She asked Rahim and Makcik to verify the notice then had Heok Hui come up to the office. There he called 'Ah Yeo's' home and his sister informed him that Mr Yeo had passed away suddenly during his Saturday badminton game (23 Jun 2007). It was a very quick way to go but he was only 52 and all of us grieve for him. We will be visiting the wake at Block 56 Sims Drive S (9380056), tel: 6742-1230. The cortege will leave on Wed 27 Jun 2007: 12pm for cremation at Mandai Crematorium. I wrote to our museum volunteers and friends earlier to inform them. I cited the interns blogs as snippets from their interactions with him capture a glimpse of him. I write to tell you with a heavy heart that Mr Yeo, one of the museum's curators, passed away last Saturday, 23 Jun 2007, during his regular badminton game with friends. I am glad that some of you had the opportunity to interact with this gentle man, including my interns who have recently been on field trips and prep work with him, see: "A hawk and two eagles," "Crabby Search," and Crocs ahoy!" "Another interesting mission Siva set me and Danliang on today was to collect bird specimens. He was informed of a donor who decided to donate her uncle's collection. We went along with Mr Yeo. It was a rickety ride in a mini-lorry to Bukit Batok. We were pretty much clueless about where block 227 was, but three brains and 6 eyes set things right. While waiting for the donor to arrive, we pried into Mr Yeo's life. Hee.. He's been in the museum so long, he's seen Prof Ng come as a student and rise as the new director! We discovered museum life changed when Prof Ng came. More specimens were collected and preserved. Before that, it was pretty much maintenace. Mr. Yeo's been thought of as a shy man, but I think it's delightful talking to him once he gets going. =)"
I myself am glad for the time I have had with him, particularly on specimen retrievals (the highlight must be the Tekong dugong), field trips (the last was crabbing at Ivan Polunin's house and the Mera Lodge stream), and plotting about gallery and education programmes." "Thanks for the info. That's really sad. He was a damn nice person always ready with a smile. I don't think I have ever seen him without him smiling warmly. And it was always easy to strike up a conversation with him and he'd always have good stories to share about BioD and the museum. " "Mr Yeo is always quiet and unassuming but always kind and helpful to students in the museum and on field trips. he's a repository of info about specimens stashed away in some obscure corner." "I first met Mr Yeo when I spent hours photographing the specimens from the first Chek Jawa transect at the museum. It was my first time doing anything like this and he was patient in showing me how to do it right (and to survive the formaldehyde). I met him many times later again, at field trips, during visits to the museum. The wildfilms crew will always remember the special trips he made possible for us last year. Then, as always, he quietly offered sound field advice, and patiently looked after everything. Mr Yeo's kind and gentle friendship will be sorely missed. Mr Yeo crabbing in Ivan Polunin's stream, 15 Jun 2006. "I remembered Mr Yeo as the very nice, kind, patient and helpful gentleman who helped me in locating specimens a couple of years ago." "I'm shocked and dismayed. He was a helpful and unassuming man who made the madness of my hons year that more bearable, exactly 10 years ago! Well those whom God love die young(er) they say. Perhaps this cliched saying could serve as solace. Sigh. The brevity of life. Seize the day we must all. RIP, Mr Yeo K L!" "Mr Yeo is a very kind man and always accommodating to last minute requests for help. He was a shy man of very few words but as I got to know him better, he became more chatty and began to share his dreams and plans post-retirement! I will miss his absence from the museum dearly." "It came as a shock when I was told this morning that he had passed on - I have known him for over 27 years - since he joined as a fresh staff and I was still an undergrad working in the then ZRC. I remembered how he was full of energy and passion for his work with specimens, and especially crabs and related invertebrates. He took care of the crustacean and invertebrate collections for most of his career, and was also the key man in many of the museum's local field collections and field work. Those who have worked with him in the museum and the field like him and have commented on his kindness and willingness to help. All the museum's foreign scientists whom he has worked with have remarked how good a worker he was. That he was still young and the manner of passing so sudden and unexpected makes the loss even more painful. I do not know really what to say --- he will be missed ... and the museum will feel the loss. Damn." As we shared tales of Mr Yeo with his six siblings and the rest of the family, they have been getting to know this other side of him - his museum curator's work, love of animals, exhibition presentation skills, love of field trips and because he was such a worrier, his unexpected sense of adventure! "The SCI impact factor ranking for 2006 is now published and the impact factor of the Raffles Bulletin of Zoology has increased from 0.422 for 2005 to 0.533 for 2006." Long-legged flies (Order Diptera, Family Dolichopodidae) are the passion of Belgian entomologist Patrick Grootaert. In Feb 2005, we announced his stay with the Raffles Museum of Biodiversity Research. Patrick, who is Head of the Department of Entomology at the Royal Belgian Institute of Natural Sciences, was on sabbatical leave here from 1st March 2005 to 28th February 2006. Explaining then that his research interest was the taxonomy, systematics and sexual behaviour of Empidoid flies, we had no idea of the limelight he would cast onto this group! As a warm up of what lay ahead, his paper with Igor Shamsev was published shortly after in April 2005. There he had described two new species - C. nigripennis was based on a holotype collected from Sungei Buloh and C. singaporensis, from a holotype caught in Chek Jawa. Almost a year later, we had exciting news. But we saved a "little" titbit for the newspapers and on 6th February 2006, The Straits Times (Singapore) ran a story that screamed "150 new species of flies found." Two weeks later at his farewell seminar, he revealed that he lay awake at night wondering how he would finish describing all those new species and that within his insect traps there were probably more species in other groups waiting to be discovered! I remember feeling thrilled that even more mangrove insects were being described and dismayed that we could lose many to extinction. Patrick went from reverence to amusement, cracking the crowd up when he revealed the names he had provided ifor new species - he had named dollies after various members of the research community and some had very interesting etymology! By now, in the biodiversity community in Singapore at least, the term "dollies" was firmly etched in our minds as dipterans in familiy Dolichopodidae. This was no mean feat, for the flies had to supplant the otherwise popular Dim Sum Dollies! In late May 2007, the latest in a series of papers was published. It is the "Revision of the genus Elaphropeza Macquart (Diptera: Hybotidae) from the Oriental Region, with a special attention to the fauna of Singapore," by I. V. Shamsev & P. Grootaert. Zootaxa, 1488: 164 pp., 31 May 2007 [pdf]. In this monograph, 59 new species of hybotid flies in the genus Elaphropeza are described - remarkable since only 79 were known of this group before! Places - E. sime, E. neesoonensis, E. chekjawa, E. bulohensis, E. temasek and E. ubinensis. People - E. yangi, E. yeoi, E. benitotani, E. luanae, E. darrenyeoi, E. murphyi, E. meieri. E. ngi, E. riatanae and E. sivasothii. Marcus Ng gets lyrical and pens "Names on the fly," The annotated budak, 14 Jun 2007. "The Belgian entomologist Patrick Grootaert has been busy surveying habitats in Singapore and Southeast Asia in recent years, seeking tiny flies that mostly thrive only in moist, muddy and mangrove-infested swamps. Little is known about them other than their existence and until Grootaert came along, many lacked names. Often, their presence is indicative of habitats that are pristine and consequently most at risk of degradation from human activities. Fourteen of these new species are found only in mangroves and the bulk of samples were collected right here in Singapore over a year. Grootaert notes that despite the extensive sampling, a third of local species are known only from singletons and doubletons, suggesting that "a large number of species still remain undiscovered." "The obvious message for conservation from Grootaert's paper is that a vast mountain of unknowns lies within the borders of� this tiny island, which prides itself in biotechnology leadership but seems loathe to protect the unique and irreplaceable genotypic wealth that yet dwell in its diminished ecosystems. " "Names on the fly," by Marcus Ng. The annotated budak, 14 Jun 2007. Notes on Patrick Grootaert in Raffles Museum news. Marcus Ng came away with a new understanding about the Sun bear's biology and a grim understandding about the fate of the the sun bear in Malaysia and the South East Asia, after attending Wong Siew Te's talk on "The ecology and conservation of the sun bear in Malaysia." "About halfway through his presentation, bear researcher Wong Siew Te showed a duotone slide. Pictured was a small sun bear cub, with a rather rotund body and bright, pleading eyes. It was trussed up like a chicken. Right after the photograph was taken by a Japanese researcher in Borneo, the cub was taken to a kitchen and slaughtered as it screamed." "About the size of a large dog but with vastly greater bulk (males reach nearly 60 kg), the Malayan sun bear is the world's smallest bear species and the least known. The only true tropical rainforest bear (a ghostly subspecies of the black bear lives in Canadian rainforests), the sun bear is a big-headed animal with sleek black fur and a yellowish mark of varying size and shape on the chest that serves to distinguish individuals. Feet bearing long curved claws help create suitable openings in tree holes for the animal to search out insects and honey using its very long tongue, as evident in the casualty on the right, which was shot simply because it was seen and its existence deemed intolerable." "According to Wong, the sun bear is now "almost gone" from Vietnam, found only in some national parks in Thailand (which incredibly cover barely a tenth of the country's vast land area), and exists in fragmented populations in Sumatra. In Peninsular Malaysia, the bears are concentrated in forest complexes such as Taman Negara, the Titiwangsa range and the Southern Forest Complex (of which Endau-Rompin National Park is but a slice). Like many other sympatric megafauna, sun bears need undisturbed forests to thrive. So as the trees are felled and land cleared of its carbon-stripping units, the earth simmers and mourns the growing loss of creatures that have survived ice ages but not the fatal pincer of man's insatiable hunger for land, lumber and lips-smacking mammalian delicacies. As ecologist Richard Corlett noted recently, many long-studied forests in Southeast Asia have nothing left but deer and boar, and some not at all. And as the elephants, rhinos, orang-utans, gibbons, tapirs and bears vanish, they take with them the future generations of trees that once relied on these beasts to disperse their seeds and carve new clearings in the jungle where saplings might sprout." Read "An unbearable future," by Marcus Ng. The annotated budak, 20 Jun 2007. See also "Wong Siew Te on emaciated Sunbears." "Speaker Siew Te made an observation about the critical role figs trees play. In 1997/8, the region experienced the most severe El Nino event. This led to the local extinction of fig wasps (due to direct impact and the haze). In the absence of pollinators in 1999, fig trees aborted their fruits [he cited Rhett Harrison's work], and there was a famine in Sabah and Kalimantan, at least (this is where there were sun bear researchers). Orang utans managed to resort to other food sources like young shoots and plant sap, but animals like sun bears and bearded pigs starved. All his six radio-collared sun bears were emaciated and two died (see photo). I know this led to starving bearded pigs attempting to raid field centres as well. This is suspected to be a reason for the very low density of large animals in Bornean rainforests." You can read more from the links at his seminar page or wait for Marcus who will blog more about this later. Since Wed 13 Jun 2007, friends have been telling me that they have seen an episode of Urban Escape featuring the Raffles Museum on TV Mobile - they caught the show on a television screen in a bus. It was a vague memory and after hunted the blog archives, I realised why. This episode was first broadcast around April 2005. The series explored lesser known places in various parts of Singapore with hosts Jeassea Thyidor and Timothy Nga. The museum was fetured in the episode on the western parts of Singapore. I haven't seen the episode myself but I do recal they shot scenes in the Public Gallery and the Wet Collection. All the comments say it was quite a nice episode, so I do hope I catch it one day. According to the schedule episodes of Urban Escape will be will be shown again at 6pm and tomorrow at 10am, 10.30am, 3pm, 8pm and 9pm. No wonder so many of my friends have seen it this time - much more than the original broadcast. Richard Mayden, Professor & Endowed Chair of Natural Sciences, and Chair, Department of Biology, Saint Louis University, Missouri, USA, and has a lab truck named the "Bride of Stinky" or BoSs. He works on osteological morphology and molecular systematics of North American fish and is visiting with us on 14th and 15th June 2007. Photo by Tan Heok Hui of Peter Ng and Richard Mayden. "In this initiative, researchers from many countries with a shared passion and in-depth understanding of these incredibly diverse and interesting fishes are investigating their morphological and molecular variation. Many of the current participants of this long-term project have a history of collaboration, sharing data, specimens, information, and ideas, and are committed to one primary objective - fostering a collaborative and productive academic environment to ensure a rapid advance of our understanding of the biodiversity and systematics of the Cypriniformes. We, as a group, hold as a fundamental premise that progress towards our mutual goals will be better accomplished in this collaborative venue than through individual researchers both competing for the same resources and possibly duplicating unorganized efforts." "The ecology and conservation of the sun bear in Malaysia"
About the talk - In first half of the talk, Wong Siew Te will talk about the ecology and behavior of sun bear and his research works on sun bear in Sabah, Malaysia. The second part of the talk will focus on the threats and other conservation issues facing by the sun bear in Malaysia. About the speaker - Wong Siew Te was born and raised in Penang, Malaysia. He earned a Diploma in Veterinary and Animal Science from National Pingtung University of Science and Technology, Taiwan, and both Bachelor of Science and Master of Science in Wildlife Biology from University of Montana, USA. He is now a Ph. D candidate in Fish and Wildlife Biology, University of Montana, and conducting his doctorate field study on Malayan sun bears (Helarctos malayanus) and bearded pigs (Sus barbatus) in Sabah, Malaysia. 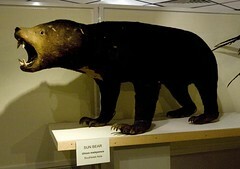 Wong studied the ecology of Malayan sun bears in a rainforest of Malaysian Borneo as his M.Sc. thesis project [online pdf of his thesis]. The study contributed our knowledge on many ecological aspects of sun bear and promoted various conservation issues related to Bornean rainforest. Beside bears and pigs, Wong's interest also include the other medium and large mammals especially carnivores, the interactions between wildlife and tropical rainforest ecosystem, and mast fruiting in Southeast Asian. Wong was appointed as the first co-chair of the Sun Bear Expert Team for the IUCN/SSC Bear Specialist Group from 2002-2005. He is now member of IUCN/SSC Bear Specialist Group and Pigs, Peccaries, and Hippos Specialist Group. "Fighting for survival," by Tan Cheng Li. The Star, 08 Aug 2006. "Friend of bears," by Tan Cheng Li. The Star, 08 Aug 2006. Wong, S. T., C. W. Servheena & L. Ambub, 2004. Home range, movement and activity patterns, and bedding sites of Malayan sun bears Helarctos malayanus in the Rainforest of Borneo. Biological Conservation, 119 (2): 169-181. [pdf]. Raffles, T. S. 1821. Descriptive catalogue of a zoological collection, made on account of the honourable East India Company, in the island of Sumatra and its vicinity, under the direction of Sir Thomas Stamford Raffles, Lieutenant-Governor of Fort Marlborough; with additional notices illustrative of the natural history of those countries. Transactions of the Linnaean Society of London, 13:239–274. "With effect from 11 June 2007, A/P Prof Hugh Tan will take over as Deputy Director of RMBR, succeeding A/P Benito Tan who retires from NUS in July 2007." "Firstly, I want to thank Ben for all the hard work and help he has rendered the Raffles Museum, Department of Biological Science and the Faculty of Science over the last 9 years - it has been a period of fantastic growth and success, and I am grateful for his help and support. He moves to NParks in the Botanic Gardens, and I am sure he will have another successful stint there." "Secondly, I thank Hugh for taking over. I have asked Hugh to help me now on a new front by putting more order in the RMBR, this is more necessary these days as we have grown in size and scope, and many things we could be relaxed about in the past today need more vigilance and efficiency. Hugh's repute in being a very organised manager will be invaluable to this phase of the museum's growth. I cannot promise him less work, but I can promise him challenges! Over the weeks to come, we will work out how we change our styles and things we need to do, and we then move on." "I hope the RMBR staff and community will join me in welcoming Hugh, and work together with him to the next level!" Photos by Lin Yangchen (NParks), taken at the Biodiversity of Singapore Symposium II.